Home - Brownstein, Vitale & Weiss P.C. Our mission at Brownstein Vitale & Weiss, P.C. is to provide superior legal representation and hold wrongdoers accountable for their actions. Our personalized team-oriented philosophy allows us to get to know you well and develop a strong case on your behalf. Our attorneys and staff truly care about our clients' welfare. We form a bond with our clients that comes from a real understanding and compassion about the stress, pain and suffering you and your family are experiencing. Personal Injury lawsuits are filed by people injured due to the negligence of someone else. The injury may be either physical or emotional. The attorneys at Brownstein Vitale & Weiss handle a wide variety of cases involving automobile, truck, motorcycle & pedestrian accidents. If you have been injured as a result of a defective condition of a property, Brownstein Vitale & Weiss will fight for your rights. If you have been injured as a result of a dangerous and defective product, feel free to contact the law firm of Brownstein Vitale & Weiss. If you have been a victim of medical or dental malpractice, we can help. Brownstein Vitale & Weiss, P.C. with over 95 years of combined trial experience has consistently produced successful results for our clients. We aggressively fight to achieve maximum compensation for our clients due to the injuries sustained as a result of the negligence of others. Members of our firm have compiled a record of success, and as a result receive referrals from our existing clients as well as other attorneys. If you or a loved one have suffered an injury as a result of the negligent actions of someone else, our office will work diligently on your behalf. 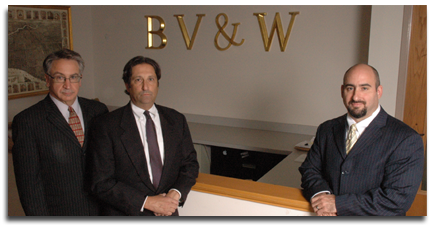 Experience, knowledge, hard work and dedication to our clients, are the trademarks of Brownstein Vitale & Weiss.